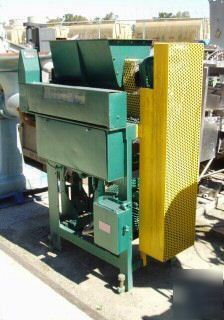 Bag filling machine, H.L. Stoker model DX, 2" diameter mild steel auger. Packer includes large RA-5 ribbon-paddle agitated hopper with 7-1/2 hp motor and shaft-mounted reducer, bag rest and settling device, product weighing scale, leveling screws, etc. All mild steel contacts.